RHODIUM AND GOLD BOG OAK PEN The Ambassador Desk Pen is made of the highest quality components and is offered in Bog Oak, one of the most valuable commodities in the work shop. 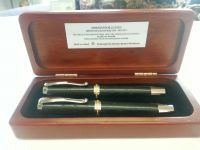 This Elegant wooden pen is made with 22k gold/colbalt accents on brilliant Rhodium finish.The Fountain pen features a top quality two tone nib with Iridium point, while the Rollerball includes a ceramic tipped cartridge for smooth effortless writing. 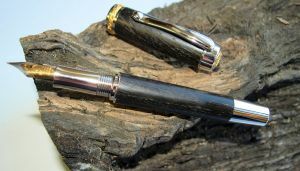 This quality wooden pen would be perfect as a unique wedding gift, grooms man gift or even a graduation gift. Something to remind you of that special occasion each time it is used. Rhodium is one of the rarest metals on earth and world production is only 3 tonnes a year. Together with Ruthenium, Palliadium, Osmium, Iridium and Platinum it forms a group of metals referred to as platinum group metals. Rhodium metal is lustrous and silvery white. It has a high reflectance and is hard and durable, (much like Bog Oak.) hence its use in phonograph needles and electrodes for aircraft spark plugs. It was discovered by W H Wholaston in 1803 in South Africa and as from 2006 it costs approxinamtely 6 times as much as gold by weight. Rhodium plating is guaranteed to last a lifetime. 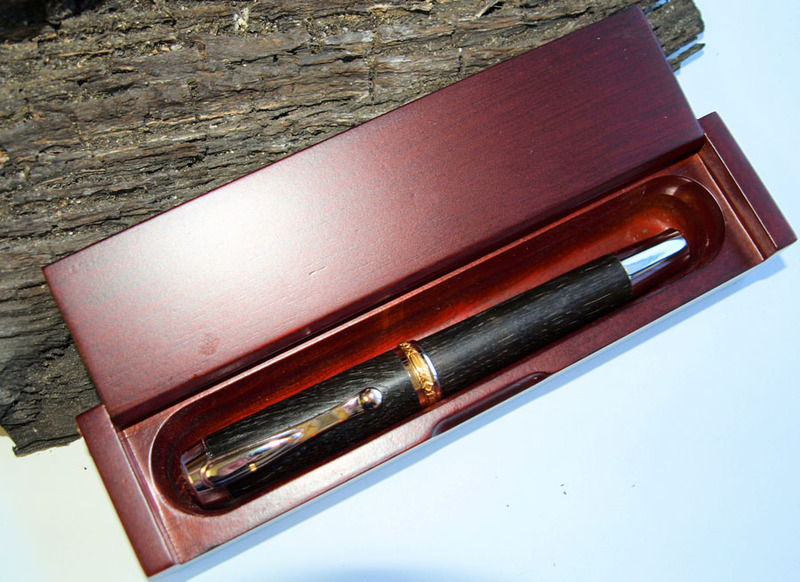 Like all traditional desk pens it is designed for use with the cap unattached. Bog Oak is a rare timber, which is excavated from deep underground, usually as a by-product of turf cutting, or land drainage. The wood varies in age, usually between 2,000 and 6,000 years old, (the Queens University in Belfast have recorded 4000-bog oak and other ancient oak timbers that spans 7000 yrs). The wood has been preserved due to the unique conditions of the turf bogs, which waterlog the wood and keep it free from sunlight and oxygen, which would cause it to decay. The chemistry of the bog also reacts with the wood and transforms its colour. When the wood is brought to the surface it petrifies becoming a deep black and almost steel hard. The Bog lands of Ireland and County Fermanagh, (where this Bog Oak originates) are a vast treasure trove for a unique material more ancient than the Pyramids of Egypt that has been naturally preserved for thousands of years. One of the most valuable and scarce commodities that exist in the workshop is Bog oak. This timber is inextricably linked with Irish history and is one of the more majestic woods used in turning.